Tuesday, April 30th @ 6:00 P.M.
“Please know I am quite aware of the hazards. I want to do it because I want to do it. Women must try to do things as men have tried. 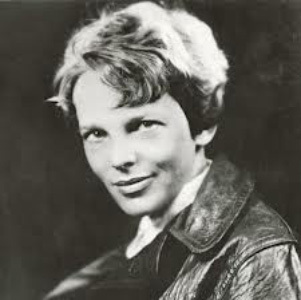 When they fail their failure must be a challenge to others.” ~ Amelia Earhart. Historian, Jim Gibbons, will present the life of the woman known as “Lady Lindy” — an American Aviation legend that on her final flight simply vanished. Did she drown at sea, or land on an island to live out the rest of her life? Was she taken captive by the Japanese and imprisoned as some claim or was she a spy for the United States Government? Gibbons will present the life and death, and the facts and theories of America’s legendary first woman aviator, Amelia Earhart!